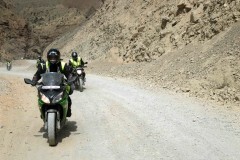 Embark on the adventure of a lifetime on this 11-day Ladakh motorbiking adventure. You'll visit the multi-coloured lake of Pangong, travel to the sand dunes of Hunder and Sumur, ride through high-altitude passes of Khardung-La and Chang-La, visit the historic monasteries of Thiksey and Diskit, apart from a range of other exciting adventures. A major highlight of this itinerary, you'll also visit the Aryan villages of Dha and Hanu in the Batalik sector. With powerful Royal Enfield motorbikes on hand, you'll roar through the highways of Ladakh with an entourage of like-minded motorbikers and an experienced support team. Surrounded by barren and arid hills as far as the eye can see, you'll travel to distant destinations in Ladakh, having new adventures and clicking picture-perfect photos. Ladakh, the land of high mountain passes, is also the land of extraordinary beauty. The Ladakhi terrain, flanked by the towering mountains of the Trans-Himalayan range, with snow-capped summits rising far beyond the clouds, is home to one of the most iconic motorbiking routes in the country. With scenic views of the landscape, painted in differing shades of grey and brown, you'll explore faraway villages and secluded landmarks in the region on a 11-day motorbiking itinerary. Your adventure begins from Srinagar, the capital city of Jammu and Kashmir. On your way to Leh, the largest city of Ladakh, you'll take a detour to visit the historic city of Kargil and the curious Aryan villages of Dha and Hanu. After exploring Leh, you'll take a few days to explore the sand dunes of the Nubra Valley, spend a night by the famous Pangong Lake and travel down to the lush, green valleys of Manali, ending the tour with unforgettable experiences. Arrive in Srinagar and convene at a pre-determined meeting point. In the afternoon, you'll meet your fellow motorbikers and your road captain for a brief orientation session to discuss the climate conditions, itinerary and other details of your upcoming motorbiking adventure. In the evening, you can explore the capital city and visit the famous Dal Lake. Overnight in a hotel at Srinagar. 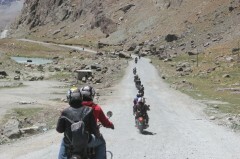 Begin your Ladakh motorbiking adventure and head east on the Srinagar-Leh highway. On the horizon, you'll begin seeing some of Ladakh's characteristic barren and brown mountains. En route to Kargil, you'll ride through the tricky turns of the Zojila Pass and cross the village of Drass, the second-coldest inhabited village in the world. You'll also halt to visit the Kargil War memorial, dedicated to the soldiers of the 1999 Indo-Pak war. Overnight in a hotel at Kargil. 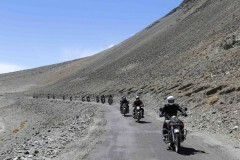 Keep riding east to reach the town of Leh, the capital city and the largest city of Ladakh. The route runs alongside the gorgeous Indus River ad takes you to offbeat locations in the Batalik sector of Ladakh, a major battlefield during the 1999 Indo-Pak war. En route, you'll stop to visit the villages of Dha and Hanu, inhabited by Aryan natives that are descendants of soldiers in the army of Alexander the Great. Take on the challenge of motorbiking over the world's highest mountain pass, the Khardung-La, at an altitude of over 17,000 feet on today's journey to Hunder. Located in the Nubra Valley, Hunder is famous for sprawling sand dunes and the Bactrian double-humped camels. Enjoy a scenic evening at Hunder or visit the nearby Diskit Monastery. Overnight in Swiss tents or a hotel at Hunder. Arrive in Srinagar. You'll be accommodated in a hotel at Srinagar. Today's meal package includes dinner only. 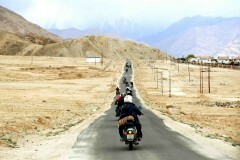 There is no pick-up for this Ladakh motorbiking trip. You begin motorbiking from Srinagar itself. Srinagar is easily accessible by road, rail or air. You can board a connecting flight via Delhi to the city's Sheikh Ul-Alam International Airport from most major cities in India or board a train to the Srinagar railway station from Delhi.